WB/DC Entertainment certainly stole the headlines when they announced Ben Affleck would be the new Bruce Wayne beginning in 2015 but quite a bit of Marvel news came in the days to follow. The vast majority of the news came from Empire Magazine in interviews with Tom Hiddleston, Thor: The Dark World director, Alan Taylor and Kevin Feige. Kevin Feige (capofamiglia of the MCU) dished out a healthy serving of news on some upcoming films and the future of the MCU. Feige reaffirmed that while Thanos will play a role in next summer's Guardians of the Galaxy, he is not THE bad guy. He did, however, surprise me a little bit by mentioning that the role of main villain would be played by Ronan the Accuser (learn all about him here) and that one member of the Guardians, Gamora (learn all about her here) begins the movie in league with Ronan, and his associates, Nebula and Korath, under the instruction of chess-master Thanos. While we all new that Ronan would fill the role of a villain, it was expected that Nebula was going to carry the label as THE bad guy. But, as my friend Zangief would say, just because Ronan is a bad guy doesn't mean he is a bad guy. Gamora's shift of allegiance is also not wholly surprising or unexpected. In the books she's had a long history and large reputation for doing some nasty things; how else do you get to be the deadliest woman in the galaxy? Feige also assured us that Thanos will be doing more than getting 3 seconds of face time in this one which means, at some point, we are going to get an actor to fill that role. What you waitin' on El Mayimbe?? In the same interview, Feige gave a little information about Avengers: Age of Ultron and also addressed the future of the MCU. On Age of Ultron, Feige made sure to mention that this time around, Hawkeye, who was relegated to mop up duty in the first film, is going to have a much bigger role noting that writer/director Joss Whedon has "a great storyline in mind for him." Feige also mentioned that with the huge fan response to Mark Ruffalo's portrayal of Bruce Banner and the Hulk that Marvel was intent on getting more screen time to the actor and that he'll play "a significant role" in the Avengers sequel. It's also very likely, as I mentioned here, that one of the yet unannounced Phase 3 movies, which Feige mentioned would be announced sometime late next spring, will be a Hulk-centric film with a story similar to the current Marvel Now title, The Indestructible Hulk. With Ant-Man the only announced Phase 3 film (currently slated for November 6, 2015) and Doctor Strange all but a lock for another spot, a Hulk solo-film would give us 3 of the 4 announced Phase 3 slots that will cover 2016 and 2017. At this point my money would be on the fourth slot being filled with something cosmic (Nova???) One character we know we will not be seeing in the MCU anytime soon, either in a cameo or his own film, is Namor, the Sub-Mariner. It had been believed that Namor's rights had reverted back to Marvel Studios but Feige told Empire that the screen rights to the Prince of Atlantis reside at Universal Studios for the time being. I'll look forward to more detail on this news, specifically when they might possibly revert to Marvel. Given that it is the October issue of Empire magazine (which is clearly why I'm able to read it in late-August) the big focus is on Marvel Studio's next entry into the MCU, Thor: The Dark World. Director Alan Taylor said quite a bit in few words. We can glean from his interview that Thor's destruction of the Bifrost at the end of the first film had many implications aside from keeping Thor away from his baby gurl, Jane Foster. Without the Bifrost not only was Thor cut off from Earth (though Odin did get him there by summoning unknown "dark energy") but Asgard,home to the peacekeepers of the 9 realms, was cut off from EVERYWHERE and, in the absence of the Asgardians, many shady characters have done some damage. Chief among those taking advantage of the absent Asgardian are the Dark Elves, led by Malektih the Accursed, played by Christopher Eccleston (learn all about him here). Malekith and the rest of the Svartalfheim, we learn, were banished in an ark 5,000 years ago by Thor's grandfather. It is this ark that we see crashing through the halls of Asgard in the recent trailer and Eccleston says he and his Dark Elves have their revenge and that he will confront the All-Father in his own throne room. Knowing that the Dark Elves will invade Asgard, it should come as no surprise when Taylor reveals that they "will be killing Asgardians" in Thor: The Dark World, and rumors have swirled that Odin's wife, Frigga will be among the dead and that, just maybe, we will see the demise of Loki. We know he won't be back for the Avengers sequel and we know that redemption has always been a part of Loki's character arc. Perhaps, despite what we've seen in the trailers and footage so far, Loki will find a way to shine. Taylor goes on to mention that the intent of this film is to die into the other Phase 2 films while leading down the path to Age of Ultron and that this fim is "Marvel turning up the volume" in terms of action and intensity. Expect this film to be aesthetically different from its predecessor and to be "dirty and dark" as it takes place during a time of war. With the rebuilding of the bridge, the Asgardians are now moving from place to place battling the hordes of baddies that have been out taking advantage of their absence. We saw quite a bit of this in the trailer and a general timeline of the movie is starting to take shape. We'll likely open with some of these battles against the so-called "Marauders" and continue to see Thor as all-powerful and invincible and the conclusion of the first act will likely be the Dark Elves invasion of Asgard, more than likely while Thor is off battling foes. Upon returning we'll see the conversation with Heimdall (seen in the trailer) and, I believe, the formation of the partnership with Loki. I assume the Elves will leave Asgard headed for Earth with the intent of drawing Thor's attention. 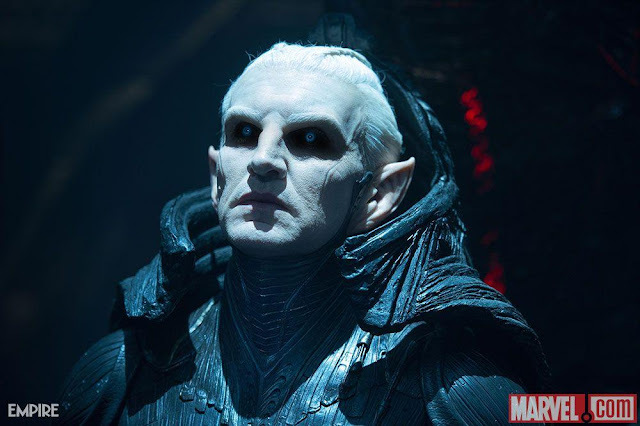 We know that Malekith is in search of "the Aether" and that it is the key to him having his revenge. We do NOT know exactly what that is in the context of this movie but, mythologically, Aether is the fifth element and basically the "air of the gods." We can infer that Malekith plans to not only attack Earth but also to use Jane Foster to get Thor to give him what he wants. We can be sure, from footage, that it is Loki that will betray Thor to Malektih. From here just how Thor will defeat Malekith and who will die before he does is not clear, just that he will and it'll be more than one person. By no means do I believe Thor: The Dark World will end on a high note. Both physically and emotionally, I do not expect Thor to be the same following the events of this film and I am very excited for what I think is going to be an uppercut to the jaw of the fanbase when it hits screens in November. Noticeably absent in the leaked Guardians of the Galaxy footage were appearances by Ronan, Korath, Thanos and Yondu. 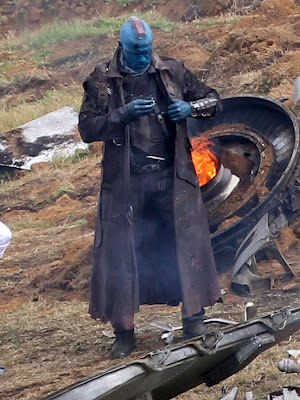 Thanks to some set pics we now have our first look at Michael Rooker all Yondid up for his role in GotG. The photos seem to show a crash site on Earth and the presence of other non-Earthers. I don't expect what we see is the final look for Yondu as I can't imagine them taking away his fin and the makeup around the fin is too shabbily done for it to be final. Safe to say Rooker's fin will be CGId in in post-production, but the rest of his look is far removed from that of Yondu in the books. That's a wrap on what's been going on since Thursday. 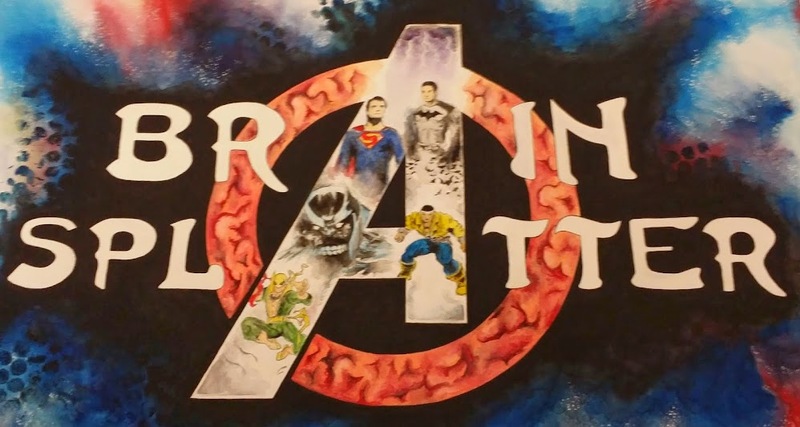 I'll be back with more and don't forget to sign up for the mailing list so you don't miss a drop of Brain Splatter!